SACRAMENTO – At least 12,000 people marched here recently, crowding on to the space in front of the State Capitol to protest corporate greed and the state’s budget cuts to public education, transportation and health services. Dozens of buses had brought demonstrators, from San Bernardino to the Oregon border, and brightly colored t-shirts proclaimed their membership in many unions and community and student organizations. The rally was the culmination of a 48-day-long, union-organized march from Los Angeles to Sacramento. Along the way, local marches, demonstrations and meetings showed the depth of anger of ordinary Californians at the cuts forced by the Republicans and the state law requiring a two-thirds majority to pass a state budget or raise taxes. Hundreds of signatures were collected on a petition to change the budget-passing requirement to a simple majority. 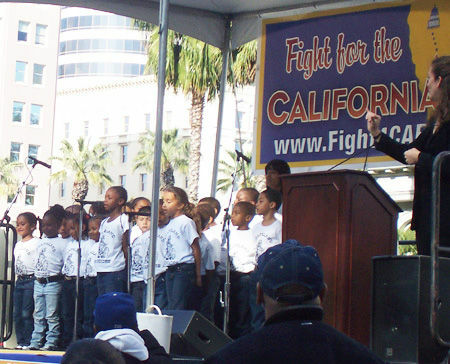 Photo: Gail Ryall – Elementary school chorus from Agapeland School in Bakersfield sings at the demonstration ending the March for California’s Future. 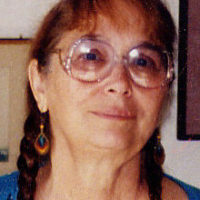 Gail Ryall is the chair of the Sacramento Communist Club and a member of the Northern California CPUSA Regional Board. 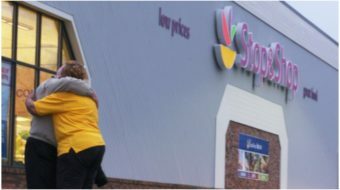 A now-retired children's librarian, she has been active in labor, women's and peace organizations for many years. Ryall grew up in upstate New York and now lives in Sacramento, Calif.